A few days ago I was sitting in the living room doing some work on my computer. I kept hearing Chloe say "shoo, shoo!" I looked up to see if she was talking about a fly. Turns out she was dancing and swatting at some sunbeams that were streaming in through the open mini blinds. Where is the video camera when you need it?!? I jumped to grab my camera,but she was nearly done with her performance by the time it was rolling. The whole thing was precious and made my heart dance. The joy that such simple things bring us, as children, seems to fade as we get older. I love these small reminders I get from watching my own daughter grow and learn. Immediately, I thought of this song that we performed in children's choir when I was small! Chloe is a copy cat! She watched me cooking lunch and Rachael Ray cooking on the television and she made her own goodies. Dancing Elmo, her stuffed animal dog and even the plastic pop-up critters on her Playskool Busy Poppin' Pals toy all tried her fare. It was as good as air can taste! I know. I tried it. I've tried a few new recipes, too. Here is one I found on Pinterest. I've checked out Leana's blog, where the recipe seems to have originated. It's a pretty fun place to look around. Check it out. This recipe tastes just as delicious cold as it does hot! It's cheap. It's easy. It tastes unbelievably like real take-out. I can't wait to cook it again! I added Chicken to Mark's but left mine vegetarian. I'll probably try adding mushrooms, broccoli or tofu next time I cook it. Ok. You caught me. I stole that from a picture on Pinterest. But then again, almost everything on Pinterest is stolen borrowed from a more creative mind. 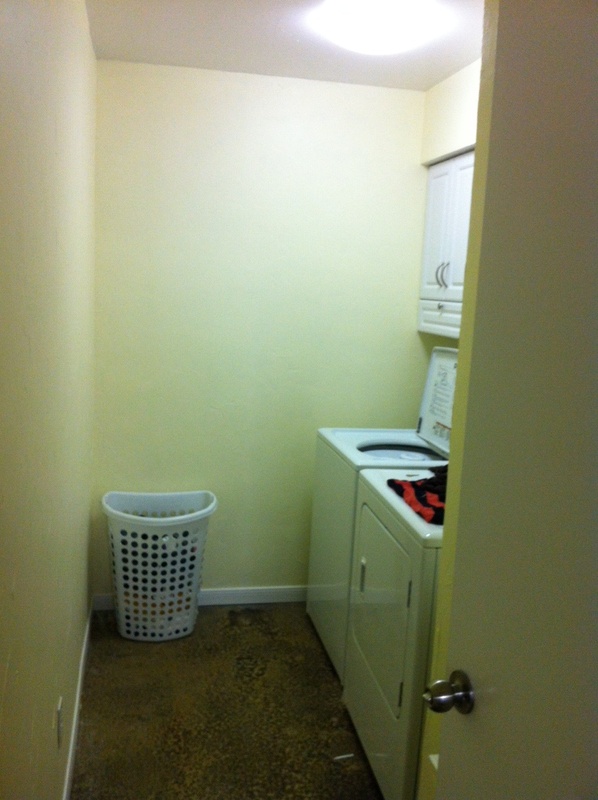 The purpose of the title is to reveal our...BRAND...NEW...LAUNDRY ROOM! Before, our washer and dryer sat in a cove in our garage. Not a huge problem, but we couldn't leave clothes in the laundry room to air dry. They would smell like gasoline if we did. 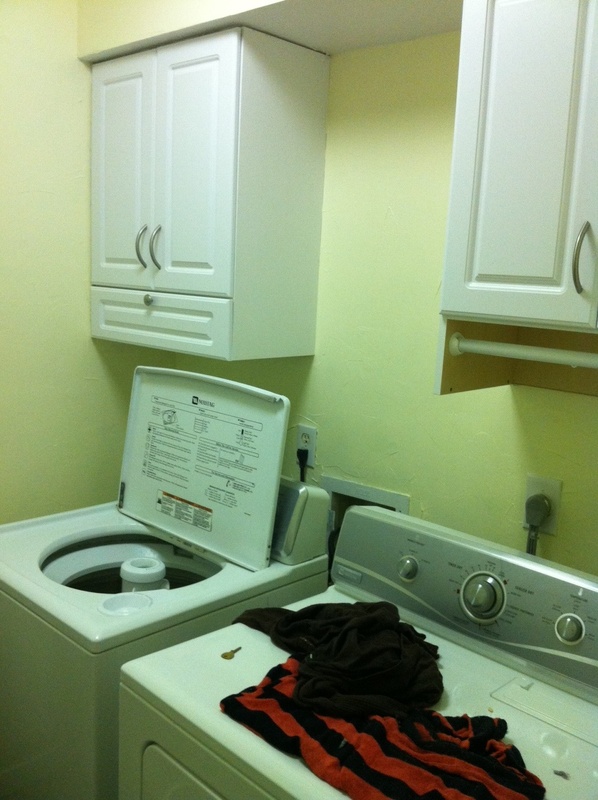 It also meant our washer and dryer always had a layer of dirt and dust on it. Don't even get me started on the bugs. I was always checking for bugs (specifically, prehistoric-size tree roaches...a common problem here) before walking out there. 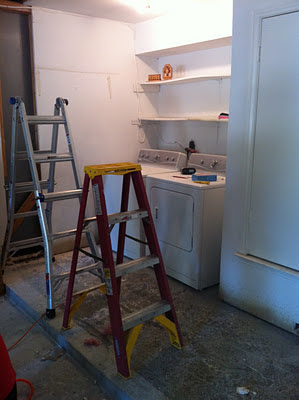 We were lucky because somebody had already hung a door in the cove for easier access to the washer and dryer. 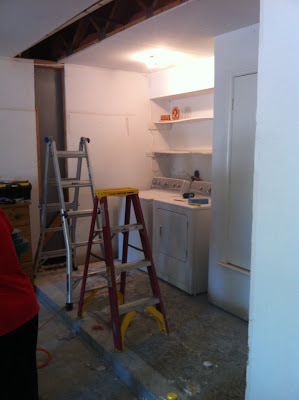 That meant we only had to add a wall and do some minor electrical work in order make an indoor laundry room! Please excuse the poor picture quality. I used my iPhone to take these. before. standing in the garage looking into the cove. Mark and I had stained the concrete a few weeks earlier. It was cheaper and easier than tile. 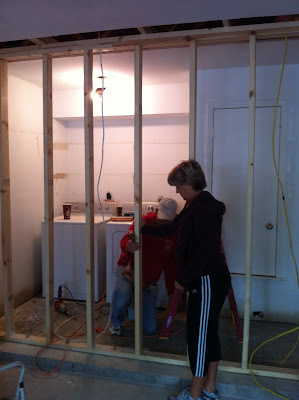 Shorty and Pop framing the wall and running wire for an outlet. Pop and I. 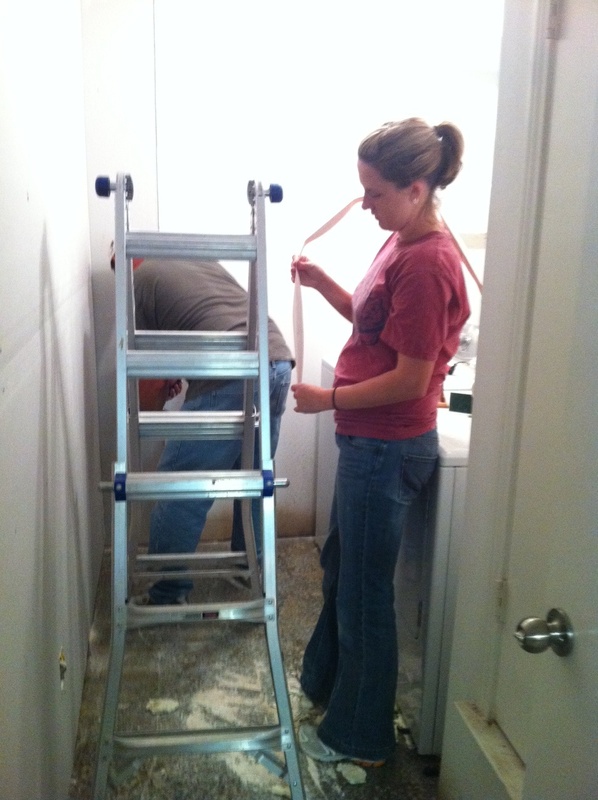 We had to tape and floating the wall. And never underestimate the value of a good project supervisor. New cabinets look much nicer than the warped shelves from before. I can't wait to hang some shelves in between the two cabinets. We will also do a touch of decorating in there. Not many people will ever see this room, but it's now one of my favorites! I love being able to do laundry INSIDE the house! Thank you so much, Shorty and Pop! We really appreciate you taking two weekends out of your busy schedule to help us with this project. Chloe will be paying you with cuddles a long time for this one! 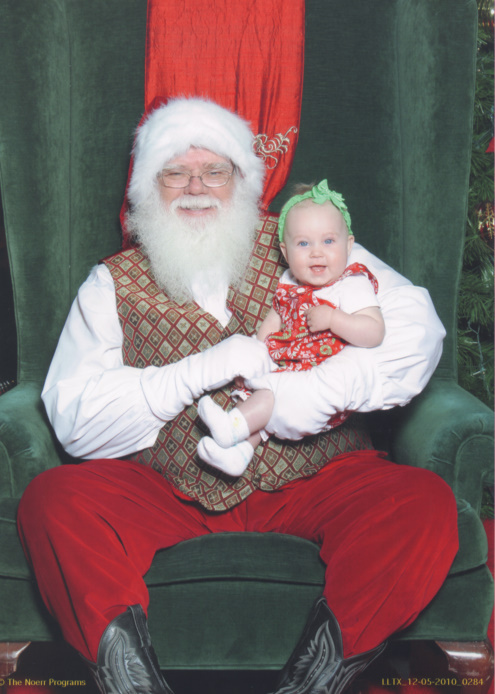 Chloe has already been to see Santa (Sassy, as she calls him). 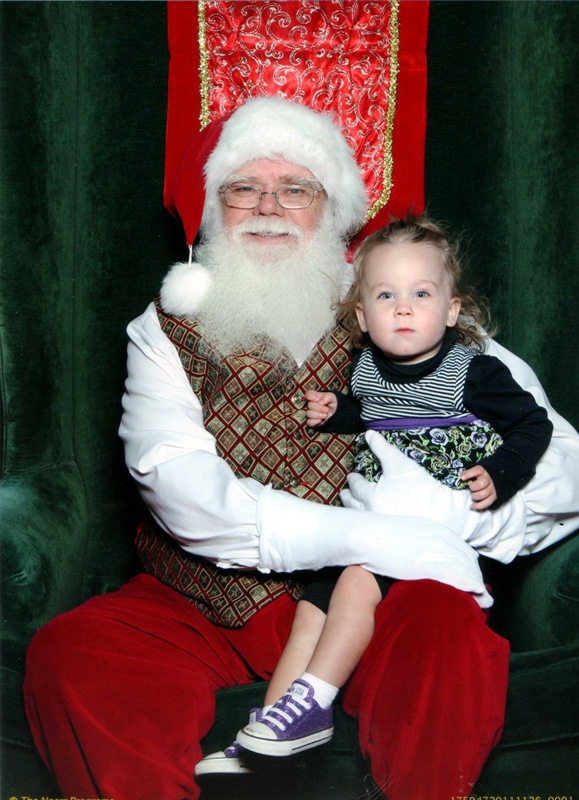 She was less than thrilled this year. No matter how hard we tried, she would not smile. She was very serious the entire time. At one point, I thought she was going to jump out of his lap. But, she sat there like a good girl and glared at Mark and I for handing her to a hairier-than-dad stranger. See how much as changed since last year? I can't believe that's the same baby! No pictures today. I just want to share something that a friend posted on Facebook. Remember your past, just don't live in it. Dream for the future, and don't dread it. Take the present and enjoy it, before it becomes the past. After their visit to my dad and brother's office. New overalls from Shorty and Pop! On our way home. Shorty and Pop wore her out! Chloe is now sitting in a booster seat and feeding herself.